It’s not just Louisville, Kentucky that gets to celebrate the annual running of the Kentucky Derby. Across North Carolina, a number of hotels and restaurants also hosted special Derby Tea celebrations to mark this year’s 144th running of the Kentucky Derby, so we decided to make a day of it at the Washington Duke Inn in Durham, North Carolina. For the past few years, this luxury hotel has been holding a Hats and Gloves Derby Tea, and this gave us a great reason to make the trip to Durham in all of our Kentucky Derby finery. As you might expect from such a celebrated destination, the entire experience was amazing. The luxurious Washington Duke Inn bills itself as a sanctuary of “more genteel times,” and the main dining room where the tea is held did not disappoint – it felt clubby and opulent at the same time. Perhaps the only surprise was that they did not have any Kentucky Derby-inspired food items included with the Afternoon Tea food options. That being said, there was palpable excitement in the air around Derby Day, and more than a few people talking about whether or not everyone’s favorite horse – Justify – would actually win the Derby this year. To mark this occasion, both my friend and I wore proper hat and fascinator attire, but almost everyone else wore beach (sun) hats with fake flowers attached. But it’s the spirit that counts, right? 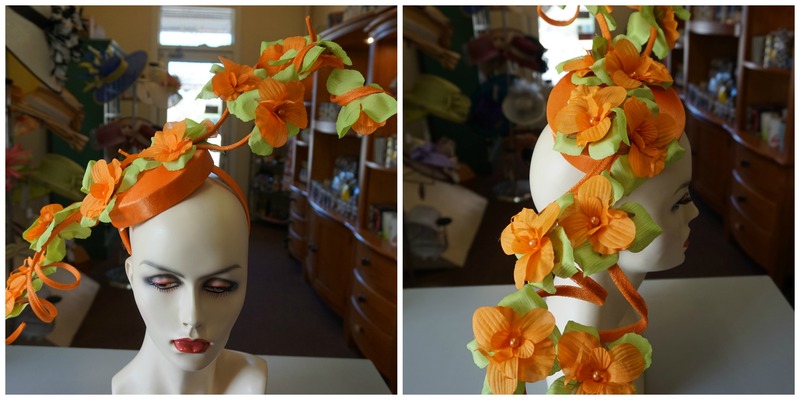 My orange fascinator was the type of hat that I like to wear to these events – it adds an element of mystique and style to any event. Don't you agree? Scones (both pear and vanilla) were delivered to the table first, then the afternoon tea tiered plate arrived along with a pot of tea. I chose the rose tea and my friend chose the oolong. Both turned out to be excellent choices. The famous Ti Kuan Yin Oolong tea had a fresh orchid flavor and clean finish, while the Rose Petal royal tea blend had a light, delicate spice to it that complemented the sweet fullness of black tea. In short, the afternoon tea was fantastic. The scones, sweets and sandwiches were all wonderful as well. There was certainly an aura of history around the entire Washington Duke Inn, and it’s obvious why it has become such a popular destination for events like birthdays and weddings. I guess you might say the entire luxury hotel is Instagram-worthy, and we certainly took our own fair share of photos, both during and after the Hats and Gloves Derby Tea. Without hesitation, we would both go back to the Washington Duke Inn for an afternoon tea. The service was impeccable, the scones were delicious, and the entire tea service was first-rate. It really did remind us of the wonderful traditions of the South. This was a very special Derby Day experience, and one that I can wholeheartedly recommend for others to enjoy as well.